Prior to development of advanced manufacturing processes and assembly lines, most industrial developments were undertaken on an ad hoc basis, springing up either close to natural resources or in urban hubs that made supply distribution easy. European cities, like Edinburgh and Dublin, are prime examples where industrial facilities stand side-by-side next to residential and commercial buildings. As the sciences of manufacturing, urban planning and transportation infrastructure advanced through the 19th and early 20th centuries, the trend developed of segregating factories and manufacturing plants and clustering them together away from living spaces and close to transportation routes. The industrial park is developed with a focus on industries rather than corporate and historically white-collar operations. The Park operates on the basis of providing specific benefits for tenants/lessee, centering mainly on the concept of economies of scale. Park developers can afford to install high-volume electricity, communications, and fuel lines, and other things like road and rail access points that would not be possible in mixed-use zones. This serves to both attract industrial tenants as well as driving down per unit cost of utilities and shipping. Till date WBIIDC has established 18 (eighteen) Industrial Growth Centres on Build, Operate & Maintain basis. One more industrial park at Falta is under development and will be made ready soon. These have geographically spread across West Bengal catering to needs of both advanced & backward industrial regions of the state. All supporting infrastructure relating to Roads, Drainage, Water & Power Supply, St. Lighting, CFC etc. have been developed by WBIIDC. Administrative Offices with supporting infrastructure & maintenance exist for all such centres. Lands / Sheds have been allotted to various industrial units. Located at Falta close to FALTA SEZ at about 55 Km. from Kolkata in the district South 24 Parganas, West Bengal. Located at Durga Chawk of Haldia within Calcutta Port Trust area in the district - Purba Midnapur, West Bengal at about 140 Km. from Kolkata. Located within Kalyani Township under Gayespur Municipality, in the district of Nadia at about 50 Km distance from Kolkata. The Growth Centre is connected to Barrackpore Kalyani Expressway (leading to Kolkata) by National Highway No. 34 (NH-34) connector. Kalyani Phase II is around 2 km away from Kalyani Phase I. and at about 50 Km distance from Kolkata. Located by the side of Barrackpore Kalyani Expressway close to Kalyani Township. 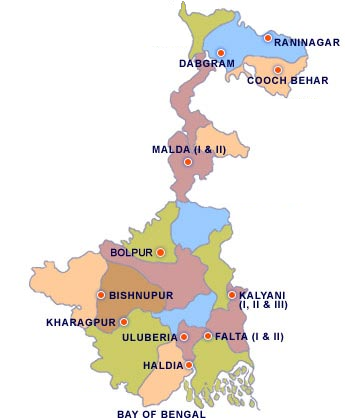 Nearby railway stations are Kalyani railway station and Kanchrapara. The place is at about 50 Km distance from Kolkata. The Growth Centre is located at Nimpura, at about 7 Km from Kharagpur town on both sides of National Highway No. 6, at about 140 Km. distance from Kolkata., with in Paschim Medinipur District of West Bengal. The Growth Centre is located at Dwarika on Bisnupur to Durgapur Road, 5 Km away from Bisnupur town and at about 156 km distance from Kolkata in Bankura district of West Bengal. The Growth Centre is located at Mouza Sibpur on Bolpur to Illambazar Road at about 5 Km distance from Bolpur railway station and at about 156 km distance from Kolkata in Birbhum district of West Bengal. The Location is about 179 kms away from Kolkata by road and 150 kms by train. The Growth Centre is located 10 km away from the Malda town along the National Highway No. - 34 towards Raigunj. It is within Malda district of West Bengal. Kolkata - 332 km. by train. Siliguri 233 Km by train. Coochbehar Industrial Growth Centre is located at 4 km distance from Coochbehar town at Chakchara adjacent to National Highway No. 31 in Coochbehar district. The nearest major railway station is New Coochbehar, which is a part of the North-East Frontier Railways and is just 2 kms away the site. Bagdogra Airport : at about 180 Km. distance. Located Just on south of Coochbehar Industrial Growth Centre. Location of Park: 50 kms. away from Kolkata towards South-West direction, near Falta Special Economic Zone. Water supply source: Underground water source. Water will be supplied through pipeline network at each plot. Telecommunication Facilities: Both land and mobile services are provided through Govt. & Private establishments.